After years of clamoring for tiny Euro-style hot hatchbacks, American buyers are finally enjoying something of a small performance car renaissance. 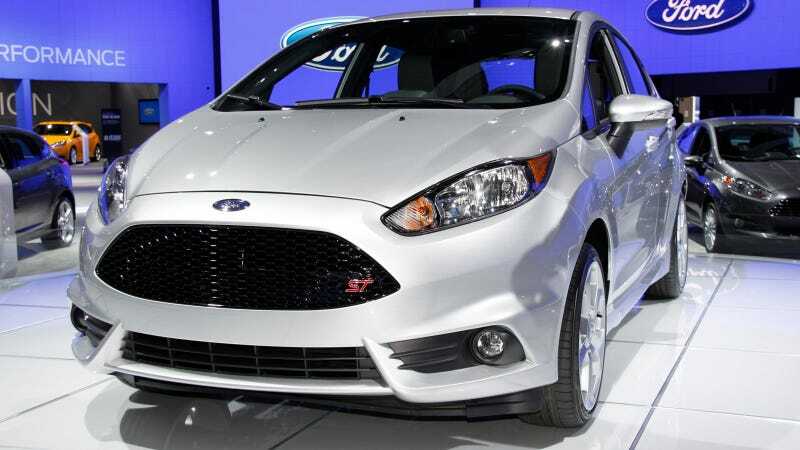 Ford's small 197-horsepower Fiesta ST is big part of that trend. Ford's 2,600-pound Fiesta is now going to get an optional 197-horsepower 1.6 liter four cylinder, backed up with 214 lb-ft of torque. It seemed like yesterday that carmakers were repeatedly telling us Americans that we didn't want that kind of power in that small a package, or just plain couldn't handle it. Even with the high-spec engine, Ford still thinks the car will get 34 mpg. Nice. The ST is fairly well set into the enthusiast mold. We only get the five-door hatch and the manual transmission. No sedan, no slushbox. Sports suspension, better brakes, and a bodykit are unsurprising parts of the ST package. Well Americans, we have seen the newest little hot hatch, now go buy one so Ford doesn't cancel production in a few years. If you're not sure whether or not you want one, check out all the great pictures by our spy photographer-for-hire Brian Williams below.